The lab is closed, everybody moved on! Even though, some projects still continue and we try to keep these pages updated. Please visit the personal pages to find out more about the new whereabout of individual people. 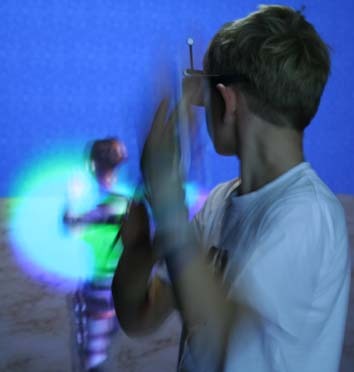 The focus of the interactive media.virtual environment group (im.ve) at University of Hamburg was on generating more compelling "interactive experiences" in real, virtual and augmented environments - ...for people! For this, we reseached, teached and worked in the areas of Art, Context Analysis, Computer Graphics, Virtual Environment Systems and Technology, and, most importantly, innovative, human-centered Human-Computer Interaction. The group was founded in 2004 by Steffi Beckhaus, who was Juniorprofessor in the department of Informatics until 2011. In 2010 it consisted of four research scientists, five student assistants and several diplom/master students. Please visit our project pages for an overview of our research.